This year marks the first time Wilfrid Laurier University’s Rainbow Centre will march in Toronto’s Pride Parade on June 28. Any group with one or more Laurier student or alumni are welcome to join the Rainbow Centre in the Toronto Pride Parade and are encouraged to show their Laurier pride by wearing purple and gold. "It is very important that Laurier is represented in the Toronto Pride Parade," said Mils Arden, event coordinator for the Rainbow Centre. 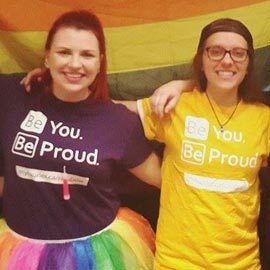 "For queer and trans Laurier students and prospective students, it means a lot that the university is represented as a safe and accepting community. Being able to march in this year’s Pride Parade as part of Laurier’s Rainbow Centre took a long time, but I couldn't be happier to be promoting Laurier and its services in this way." On June 15, Laurier Brantford celebrated Brantford Pride – co-hosted by The Bridge – with numerous Laurier representatives in attendance for the Pride Flag Raising ceremony at City Hall. Brantford Pride week culminated on June 20 with the Pride Walk down Colbourne Street, where a Laurier flag was proudly carried, and entertainment and family activities held at Mohawk Park. The Rainbow Centre and Rainbow Alliance are safe and inclusive spaces on Laurier’s Waterloo and Brantford campuses that are available to all students, faculty, staff and visitors who are interested in learning about queer and trans communities. The student-run organizations enhance the university environment for queer and trans individuals in the Laurier community through awareness promotion, education, advocacy and support. For more information about the Rainbow Centre and the Toronto Pride Parade, please contact Mils Arden at arde1400@mylaurier.ca or join the Facebook group for updates. Parade participants are invited to meet at 1:30 p.m. on Sunday, June 28, in section K46 on Bloor St. between Ted Rogers Way and Church St in Toronto. For more information about Laurier Brantford’s Rainbow Alliance contact Falynn Whynacht fwhynacht@wlu.ca. If you are interested in joining Brantford Pride or The Bridge, please contact Rebecca Godderis at rgodderis@wlu.ca.